On the front page of the LA Times today, greeting the new year, is a story about a man with a plan in Iowa: "Surrounded by cornfields that stretch to the horizon," we read, "in a place where molehills pass for mesas, avid outdoorsman Don Briggs has long dreamed of climbing a mountain. So he decided to build one." He's not a geotechnical engineer, or some wildly charismatic salesman of earth-moving equipment; he's just a man with a water hose and access to a few corn silos. 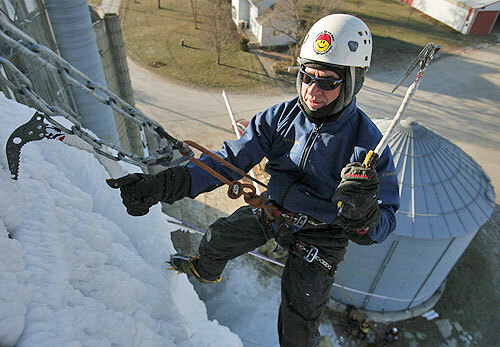 "Briggs spends most winter nights hosing down a quartet of grain silos on a friend's farm – and relies on the Corn Belt's frigid temperatures to transform the water into frozen walls of ice that tower nearly 70 feet straight up," the LA Times writes. 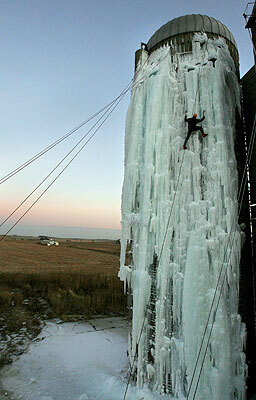 "By the time he's done, the ice encasing the outside of the silos is 4 feet thick in spots – and ready for the onslaught of ice climbers drawn to this strange marriage of farming and extreme sports." [Image: There would sometimes be "a heat wave," Don Briggs told the LA Times, "when the temperature got up to 40 degrees or warmer, and all the ice would fall off the silos and we'd have to start all over." Photo by Matthew Putney, for the LA Times]. The transformation of architectural structures into geological objects is something worth pursuing; in a way, it reminds me of a fairly minor pet peeve of mine, which is that people like Colin Farrell, or Lindsay Lohan, come out to Hollywood or move to Manhattan, and they make tens of millions of dollars... and they buy liquor with it. Or crystal meth and expensive dresses. Or whatever it is that River Phoenix did. If you're going to get addicted to something, make your addiction interesting. 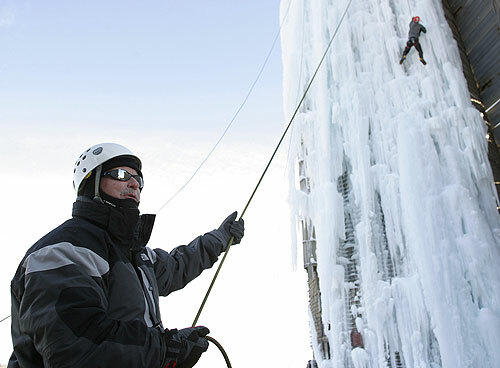 There's also the Alaskan Alpine Club. Don't people DONATE money to charities anymore? ?